Searching for Boko Haram: A History of Violence in Central Africa. Scott MacEachern. New York, NY: Oxford University Press, 2018. …what we call terrorism today does not simply arise like a boil emerging on the skin where there seemed to be nothing before. Often appearing in these frontier lands, what we call terrorism today does not simply arise like a boil emerging on the skin where there seemed to be nothing before. We become aware of it when it appears to present a threat to the West on its own or as an expansion of something we have chosen to view as monolithic and familiar. This applies to groups like Boko Haram, whose loose alliance with al Qaeda or the Islamic State networks is opportunistic. Groups claiming such allegiance and appearing part of something far larger than a local insurgency enhance their prestige and recruitment capability. Sometimes these fealty pledges also result in some funding, training, supply chain entrance, or other useful support. In reality, these are disparate entities with deep geographic and cultural roots that make them unique nodes with varying levels of shared goals and methods. In the case of Boko Haram, MacEachern endeavors to explain the local context of its organizational evolution as part of the cultural geography of its region. Even the derivation of the name itself is complicated but well worth absorbing if one is to understand the group’s origins and motivations. The author provides an interpretation from Hausa linguist Paul Newman that counters the common view that Boko derives from the English word book, suggesting that the group strives for ignorance among its adherents and is translated as “Western Education is Forbidden.” MacEachern notes Western education in the region has traditionally been mainly for the elites, whom Boko Haram’s founders saw as corrupt and far removed from the populace. Thus, the term is more likely to mean something closer to “deceitful or useless education is forbidden,” promoting a return to traditional religious teaching. As long ago as the 17th century, a significant driving social force that ultimately spawned today’s Boko Haram was in motion as various Muslim clerics chafed at rulers and elites for their tolerance of non-Muslim practices among their subjects and corruption within their own ranks. They sought to instill a stricter and more pure form of Islam. Today’s upheaval is not a new phenomenon, but part of a cycle of struggle between modernity and tradition. By the 1990s, early effects of intensified globalism and economic disparity between north and south increased in Nigeria and combined with the results of migration caused by droughts in the 1970s and 80s. At the same time, federal power was decentralized, leading to the increasing influence of religious leaders in some areas, many of whom battled intellectually for hearts, minds, and sharia. Economic deprivation and corruption were catalysts for increasing adherence to extremist ideologies that would level things out in the cultural and geographic environment serving as the incubator for Boko Haram. The most significant historical change that ultimately made this land fertile for Boko Haram was environmental and took place 6,500 years ago, when Lake Chad began to gradually but inexorably recede from its status as a mega lake. As a result, populations directly and indirectly dependent upon the lake had to adapt and change, and sometimes migrate, all of which caused cultural and identity shifts. Lake Chad’s rate of shrinkage has markedly increased since the middle of the 20th century, while the populations relying on it have tripled since the late 1980s, intensifying the conflicts that have always existed in the region. To recognize that slave raiding and trading has taken place in this region for over one thousand years, and has shaped the very ethnography itself, gives the reader a new appreciation that Boko Haram is not your garden variety violent Islamic extremist group. It also places the 2014 Chibok kidnapping of predominantly Christian girls into historical context as a singular episode in a long tradition of critical economic activity, that only officially ended in in the first half of this century. That historical tie was purposely underscored by Boko Haram leader Abubakar Shekau’s public pronouncements that the captives would be sold “in the marketplace,” as their forebears had been. Through the centuries, Islamic slave raiders moved across the plains, causing the most vulnerable populations to flee to the mountains for safety. Traders themselves identified degrees of “Muslimness” in populations to ensure that only those they viewed as infidels were enslaved and not those of the traders’ own kind, as that would be sinful. Those who remained on the plains either fought back effectively or pledged allegiance to whatever version of Islam was demanded to remain free and adjusted their behavior accordingly. Those who fled to the Mandara Mountains and eventually became today’s montagnards, adapted to their new topographical reality by developing new farming methods and new food sources and adopting other survival strategies. This led, after generations, to cultural and linguistic divergence between those who stayed and those who left. As noted, for morality’s sake, those who are enslaved must be considered outside the cultural group of the slavers. They must be of a different ethnic, linguistic, geographic, belief group, or caste. Famed psychologist and genocide scholar Ervin Staub noted societies often enact a process of devaluing outgroups to “justify their suffering by their evil nature or by higher ideals. A changed view of the victims, changed attitude toward that suffering, and changed self-concept result.” Those living in predation zones could then be considered a type of outlaw; people not conforming to the concepts of state and law as they were out of sight in remote areas often governed alternatively and less under the state’s total control, thus somewhat outside the law. The connotation of bandit or savage was also associated with such populations and they could then easily be enslaved or considered criminals who deserved such treatment. Even today, certain ethnic groups and classes around the globe engender such perception of deplorability among their neighbors no matter what their actual economic activities. As smuggling is so prevalent in frontier zones, it is considered normal commerce by most inhabitants, but criminal by the state which it robs of revenues. This outlaw designation directly relates to those the state will consider today’s insurgents or terrorists, monikers often predetermined years or even centuries before current circumstances ignite violence. 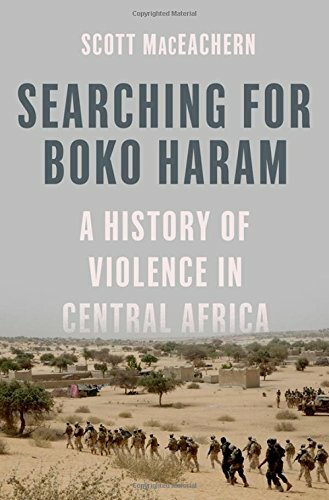 MacEachern describes the innovative smugglers and bandits on this frontier in a most interesting chapter on the specific technologies such criminals were already using that abetted the development and growth of Boko Haram, specifically Kalashnikovs, cell phones, and motorcycles. The description clearly applies to so many frontier areas typically misidentified as ungoverned and lawless, where the population considers smuggling perfectly legitimate, as it brings desired goods and denies revenue to a state that has chosen to neglect it. These alternatively governed frontiers proliferate today and spawn various separatist or criminal organizations that we call insurgents, narcos, or extremists. Thus, we maintain what MacEachern describes as “European ignorance of the socio-political structures of the region.” This leads to endless attempts at stabilization operations in the mode of the Colonial powers who “were never willing to invest the resources [and administrators] necessary to actually transport European Systems of territorial control.” MacEachern further notes that “outlaws may cease to be bandits if their activities are recognized as being legal; as when they settle down and start behaving in ways that state elites find more comprehensible.” The next chapter describes this process in the American West through the government’s efforts to turn so-called savage natives into farmers and ranchers who stayed in one place as instructed. Another case MacEachern explores is the effort at disarmament, demobilization, and reintegration in its infancy in Colombia. …the story becomes a rich contextual chronology of the deep roots of this group and its environment. The last three chapters were a delectable treat that made the rough trek entirely worthwhile. Searching for Boko Haram exemplifies the words of Pink Floyd: "If you don't eat yer meat, you can't have any pudding.” The density of the first four chapters resulted in a Herculean slog through archeological discourse describing the past seven millennia in the Central African region just south of Lake Chad. MacEachern’s detailed journey through time and space from 500 BCE includes a deep dive into the region’s geography, archaeologically-derived history, ethnography, culture, and linguistics that is probably beyond the interests of the average national security or military affairs professional. However, once these details are at least partially digested, the story becomes a rich contextual chronology of the deep roots of this group and its environment. The last three chapters were a delectable treat that made the rough trek entirely worthwhile. The author meets his objective of proving that “this land is not simply a blank slate, a savage and remote part of the world embroiled in terrorism.” We have much to learn from this dense but informative book about Boko Haram and our approach to stabilization by understanding the historical context and boundaries of insurgency in this region and around the globe. Diane Chido is a security and intelligence analyst and the President of DC Analytics. Scott MacEachern. Searching for Boko Haram: A History of Violence in Central Africa. Oxford University Press, New York, NY, 2018, pp. 22-26 and 40. Newer PostIs It Time to Abandon the Term Information Operations?